Last week was a huge week for horse racing. Now I must admit, I only ever bet on the horses three times a year. But this year, I have learnt something new. Apparently, (and no-one told me this before) studying the form in horse racing is not the art of picking a horse because it has a pretty name, or it has the name of a family member in it. I know, I was as shocked as you. So Diamond Harry (my dads name was Harry) was probably not a wise bet for the Cheltenham Gold Cup. (Ok, it definitely wasn't, I think it is still running) stupid horse. The same goes for a horse with your football teams name, the name of your first dog or the name of your ex best friends, cousins, second girlfriend that he fingered in the park that one time. (Um, too much?) None of these flashes of recognition are going to make your horse any faster and be a dead cert in the 2.40. Sorry about that. 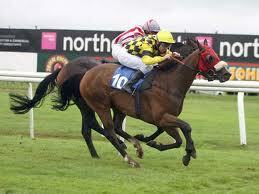 Another small tip I have picked up is that you don't pick a horse because you like the colours the jockey is wearing. Yes that orange top is SO trans-seasonal, bang on trend, (Sorry? it isn't orange, it's clementine? Oh my bad) and YES it does clash, (I mean compliment) that green (Ok, ok, peppermint) but the jockeys taste for spring trends does not automatically make it a winner. The last piece of advice that I can offer you grasshopper, and I must admit that I am very very guilty of this. The only problem I have now is that the Grand National and The Derby are fast approaching and I have NO WAY of picking the winner. So share with me YOUR tips. What is your way of studying form? How do you pick yours? Umm, by white horse I think your mean grey...grasshopper. Great post as ever. The important thing to say about Cheltenham is that it has an uphill finish... makes you sound like you know your way around a course. I only ever bet on the Grand National...and I go for the combination of pretty horse+pretty colours = good shot. If it has a name that means something to me...well then that's a dead cert! Oh! 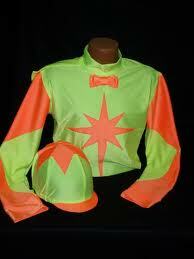 And it's DEFINITELY going to win if the jockey has the colours I used to wear when I went horse riding when I was little! Good or funny name has always worked for me. It's got that added element of sophistication above random pin in the newspaper. The old pin in the paper trick. I don't bet on horses, but, you can bet if I did it would be the 'oooh pretty horsey' method lol. I find if you read the horoscopes the week or two before. There is always a horse related prediction in them. "Luck bets on horse number six." A few years ago I did and I won £20. I now ask my 14 year old son to pick a horse or dog for me, place a whole 50p bet and have won quite often. I think he may have special powers, spooky dooky. He won't tell me how he picks them though, he's evil like that.